Two independent ways tune Rho1 activity: 'Wireless' and 'non-Wireless'. Wireless/p114RhoGEF is required for the junctional Rho1 signaling (green) in order to regulate Myosin II planar polarized localization (wires-like pattern). Medio-apical Rho1 signaling is indicated in magenta. Both Rho1 signaling pathways contribute to actomyosin contractility, which in turn results in elongation of this ectodermal tissue in the Drosophila embryo (schematic visualization). This preprint by Garcia De Las Bayonas et al. 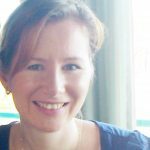 (the Thomas Lecuit lab, Marseille, France) aims to identify upstream regulators of Rho1 activity in germband extension during Drosophila embryogenesis. Based on their previous work and that of others, this process is driven by cell intercalation that depends on medio-apical Myosin II pulsing activity and the planar polarized vertical junctional Myosin II pool, resulting in a shrinkage of vertical junctions, cell shape changes and in subsequent Drosophila embryo elongation. How actomyosin contractility is precisely regulated upstream of the Rho1 activity remains unclear not only for this tissue, but also for other animal tissues. To find out where is localized the active Rho1 in the Drosophila ectoderm, the authors elegantly employed a Rho1-GFP biosensor that binds active Rho1-GTP, revealing that active Rho1 localizes medio-apically and in a polarized manner at junctions in ectodermal cells. This differs from uniform Rho1 protein distribution at cell junctions, indicating that Rho1 activity is spatially regulated. From the authors’ previous work, it is known that RhoGEF2 regulates the medio-apical pool of Myosin II. Here the authors provide further evidence that RhoGEF2 activity is polarized and regulates medio-apical Rho1 activity but not the Rho1 activity at cell junction. The puzzling bit comes when the authors find that the RhoGEF2 protein itself localizes apically, at cell junctions and also resembles comets in the cytoplasm of ectodermal cells. What regulates medio-apical RhoGEF2 activity to spatially activate medio-apical Rho1 signaling? 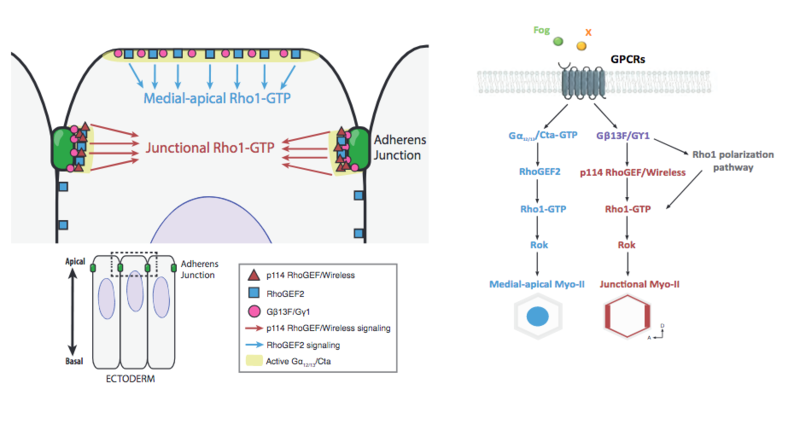 Inspired by the work from the Drosophila mesoderm, the authors find that Gα12/13/Cta is required to localize RhoGEF2 and that it does so by releasing RhoGEF2 from microtubule plus ends in order to recruit it medio-apically and at cell junctions. However, it remains to be resolved what regulator restricts RhoGEF2 activity medio-apically. Next, the authors wanted to know what regulates the junctional Rho1 signaling. By knocking down all 26 RhoGEFs and looking at the defects of germband extension, the authors find an uncharacterized gene CG10188. It is the ortholog of mammalian p114RhoGEF and causes main germband extension defects. The authors find that its knock-down affects active Rho1 levels, Myosin II and E-cadherin specifically at cell junctions. Vice versa, p114RhoGEF overexpression increases Myosin II junctional localization and its planar polarity there. This provides evidence that actomyosin contractility at cell junctions is regulated by p114RhoGEF. As Myosin II resembles wires in the tissue and that these wires are lost upon p114RhoGEF knock-down, the authors call the p114RhoGEF gene ‘Wireless’. This leads the authors to a conclusion that Wireless and RhoGEF2 have additive but non-redundant function in ectodermal cells. One regulates Rho1 activity at cell junction while the other one regulates Rho1 activity medio-apically. So how can the Wireless protein work/regulate Rho1 activity at junctions? First, the authors investigated Wireless subcellular localization and found that Wireless-GFP exclusively localizes at cell junctions in the ectoderm. Its junctional enrichment is controlled by the G proteins Gβ13F/Gγ1, previously found to regulate medio-apical and junctional Myosin II. Together, Gβ13F/Gγ1 and p114RhoGEF/Wireless quantitatively tune Rho1 activity in order to regulate Myosin II only at cell junctions. This preprints identifies two independent Rho1 signaling pathways that regulate actomyosin contractility in two different cell compartments, medio-apically and at cell junction in the Drosophila ectoderm. RhoGEF2 regulates medio-apical Rho1 activity while p114RhoGEF/Wireless controls Rho1 activity at junctions in the Drosophila ectoderm. The authors also identify that these RhoGEFs are under spatial control of distinct G protein subunits. Placed to a bigger picture, the authors suggest that the Rho1 signaling might be evolutionarily conserved in terms of combinations of various G proteins together with RhoGEFs/RhoGAPs in other invertebrate and vertebrate systems. Interestingly, the Wireless pathway is not present in the Drosophila mesoderm where no intercalations can be found. Therefore, it will be interesting to test whether such identified mechanism that distinguish medio-apical and junctional Rho1 pool is also applicable on the other Drosophila tissues such as male genitalia where angular cell intercalation drives tissue rotation1. On a similar note, it will be interesting to test whether a similar medio-apical RhoGEF2 pathway may work during the Myosin II pulsing phase in mid Drosophila oogenesis2. This preprint is, as always, an inspirational piece of work from the Lecuit lab. It is a must read for scientists interested in the involvement of actomyosin contractility in developmental processes. 1 Sato, K. et al. Left-right asymmetric cell intercalation drives directional collective cell movement in epithelial morphogenesis. Nat Commun 6, 10074, doi:10.1038/ncomms10074 (2015). 2 He, L., Wang, X., Tang, H. L. & Montell, D. J. Tissue elongation requires oscillating contractions of a basal actomyosin network. Nat Cell Biol 12, 1133-1142, doi:10.1038/ncb2124 (2010). The localization of the Wireless and Gβ13F/Gγ1 proteins are not planar polarized at junctions in contrast to Rho1 and Myosin II. Have you investigated any of the 23 RhoGAP candidates that inactivate Rho1 function? 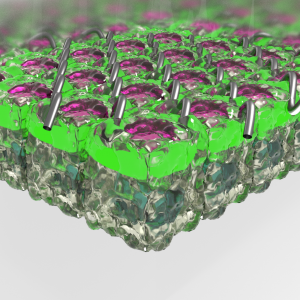 Are there perhaps any candidates that are polarized at cell membranes in an opposite way, i.e. on the transverse junctions? Why do you think there is a need for two different Rho1 signaling pathways within ectodermal cells, would the Wireless pathway be not sufficient to drive the germband extension by itself? We definitely need to integrate RhoGAPs in our approach to fully understand how Rho1 activity is controlled in the ectoderm. As you mentioned, RhoGAPs could be polarized at transverse junctions therefore decreasing Rho1 signaling at these specific cell interfaces. Interestingly, a differential enrichment in the RhoGAP Gap21/23 at cell junctions polarizes junctional Rho1 activity in Ciona robusta during neural tube closure (Hashimoto and Munro. 2018; https://www.biorxiv.org/content/10.1101/425165v1). Whether such mechanism is conserved in Drosophila is an exciting possibility. None of the RhoGAPs have been studied so far in the extending ectoderm and this is an area of future investigations. Previous work in the lab have shown that both medial-apical and junctional Myo II are required to drive cell intercalation and tissue extension in the Drosophila embryo. In our current study, we were able to genetically uncouple the medial-apical and the junctional contractility through the knock-down of RhoGEF2 and Wireless respectively, both leading to extension defects. Now, the fact that Rho1 activity is regulated by two distinct RhoGEFs in the ectoderm could be a way to set up different regimes of actomyosin contractility in given subcellular compartments. This may be important to achieve a proper tissue extension. Moreover, these signaling modules are tissue specific as exemplified by the comparison ectoderm/mesoderm. It is likely that the emergence and combination of these signaling modules across evolution have been key to expand the morphogenetic repertoire.